If there is one supporter of further reforms in France, it is probably the strong economic context, which is due both to the reform momentum and the high-cycle dynamism of the rest of the Eurozone. So far, the high confidence level has been broadly spread across sectors and suggest that the domestic economy should continue to grow strongly in 2018. In the manufacturing sector, activity is set for a 2.4% rebound in 2017 after a paltry 0.4% YoY in 2016. As activity started 2018 at the same level as in October 2008, there is room for further recovery. With confidence indicators at a ten-year high, we expect 2018 manufacturing growth to reach 4%. Most companies in the manufacturing sector have remained upbeat about the general economic outlook since October and order books were still at their highest levels of the last ten years in December. Prospects are just as bright in the building sector where confidence also reached a high point at the end of the year, as expected activity is on the rise. Low-interest rates and a recovering housing market is essential for this sector which has been in recovery mode for the last three years. The December survey showed that hiring intentions remain high in building activities. In the service sector, the rise in confidence looks more sustainable than in early 2017 as it is supported by the highest confidence level in the general outlook in years. Hiring intentions in services recovered in December to their high mark of last April which, together with similar signs from the building sector, is great news for the job market. Finally, even the retail sector gave signs of a revival of its hiring intentions as this component of the survey was above zero for the first time since 2012. But as we all know, it takes time to translate these good intentions into higher employment growth. 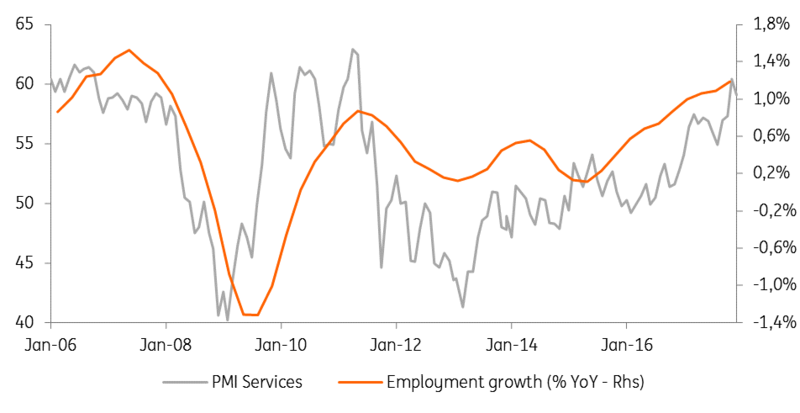 The French recovery started at a slow pace in 2014, boosting private employment growth only very slowly. It took three years to go from 0.0% growth on average to 1.4% YoY in 2017 (9 first months). This rhythm is, however, still too low to trigger a fast decline in unemployment. French unemployment was still at 9.4% in 3Q17, higher than at the beginning of the year. An explanation is that 72.4% (on average) of unemployed people who were on one of President Hollande’s subsidised job schemes or training did not find a job after that period and they are now flowing back into the unemployment statistics. Over the first ten months of 2017, this amounted to 65-thousand, which explains why the unemployed population has increased by 16-thousand so far in 2017 after the 113-thousand decline in 2016, despite the acceleration of the recovery in the second half of this year. That said, with GDP growth accelerating towards 2% in 2018 and supportive labour market reforms, employment growth should accelerate further in the second half of this year. This should allow for unemployment to decrease to 9% at the end of the year. Domestic demand growth was back at its mid-2016 level in the third quarter. 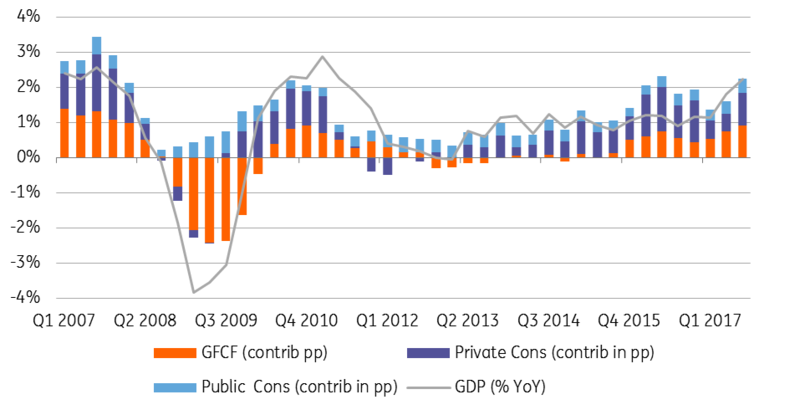 The difference is that this year’s growth is more balanced between investments and consumption: contribution from investments to GDP growth was 0.9pp in the third quarter, its highest level since 2010. Private consumption contributed the same. Corporate investments are particularly dynamic given that higher activity levels are pushing up capacity utilisation which is driving corporate investments. Moreover, under Macron, the corporate tax rate will be cut from 33% to 25%. In 2016, the growth contribution of business investment was almost entirely due to fiscal measures. The effect was short-lived. This time it is driven by demand, which is why we expect the rebound to be sustained in 2018 and 2019 where we expect growth of 5% and 4.2% respectively, after 4.4% this year. Together with strong households’ investments (still backed by low-interest rates and the prospect of housing tax cuts), this should bring investment growth from 3.6% in 2017 to 3.9% this year. Private consumption should also continue to recover as consumer confidence will benefit from declining unemployment and tax reforms. While the Hollande era was often synonymous with higher taxes in people’s mind (although this is not true on average), PM Philippe has been avoiding that reputational mistake. If his Government were criticized at first as “the Government of the rich”, the fact is that purchasing power among workers should rise in 2018, while a flat 30% tax on financial income has consolidated a number of schemes. We expect private consumption growth to catch up to its 2016 level in 2018 (2.2%) after 2017’s blip (at 1.2% only). Growth will therefore continue to be mainly based on domestic demand. So far, the negative contribution of net exports in 2017 has been compensated by inventory effects but it will nevertheless be -0.6pp, somewhat less negative than in 2016 (-0.8pp). We expect export growth to recover in 2017, at a healthy 3.4%. However, the recovery in private consumption and investment goods’ demand will probably be quicker, leaving negative external trade contributions for 2018 and 2019. The economic recovery is shifting into higher gear, backed by the highest confidence levels of the last ten years. It is hard not to recognise the positive effects of the reform atmosphere the Philippe Government has succeeded to install. Even if most measures will not take effect before some months, expectations can be built on stronger ground. We expect reforms to continue in 2018, which should help GDP to reach 2.0% this year. With a popular PM and a weak opposition, it seems the path to reform hasn't been this clear since 2007, an opportunity that President Macron certainly intends to seize.